Need Help? Research Consultation Librarian Jutta Seibert is here to answer your questions. 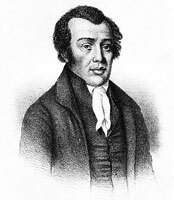 Where can I find reputable information about the life of Richard Allen, the founder of the African Methodist Episcopal Church and famous Philadelphian? The Library’s biographies topic guide is a good starting point. It lists biographical dictionaries available here at Falvey, online and in print. Read the resource descriptions carefully in order to identify the dictionaries which cover U.S. subjects from the eighteenth and nineteenth centuries. Both the American National Biography Online (ANBO) and the African American Studies Center (AASC) are good choices for biographical information on Allen. The excellent bibliographies of ANBO biographies cite secondary and primary sources and list relevant archives with unpublished primary source materials. ANBO has nearly six times as many total biographies as AASC, but, regarding African American biographies, AASC is the more comprehensive resource. AASC includes the African American National Biography. Allen is covered in both resources because of his historical importance. AASC also includes more topical entries, such as the essay on the African Methodist Episcopal Church, than ANBO, and only AASC includes primary sources, such as the full text of two of Allen’s sermons. How can I find book-length biographies of Richard Allen? Both ANBO and AASC have bibliographies which cite book-length biographies. The library catalog is another good source for monographic biographies: Start with a simple keyword search, but remember that both “Richard” and “Allen” are fairly common names. Try Richard Allen Methodist. Notice that all the results are right on target. Use the subject link in one of the relevant results to further narrow your search results if you retrieve too many irrelevant titles. The subject link for Allen is Allen, Richard, 1760-1931. Use WorldCat, a union catalog of libraries worldwide, to find biographies which are not available here at Villanova and request them via interlibrary loan. How do I find books, letters or sermons written by Richard Allen? Both ANBO and AASC biographies cite selected primary sources. The same is true for the monographic biographies available in the library’s collections. Use the author search option in the library catalog and click on the author link with Allen’s birth and death dates. Most of Allen’s works are available in Falvey’s digital collections. The Christian Recorder, a publication of the African Methodist Episcopal Church, is part of the African American Newspapers collection. The Recorder includes a number of articles contributed by Allen. Contact me if you would like to find more of Allen’s works. Are there any other materials on Allen which I should consider? Yes, there is much more to discover. The library catalog lists fifty-six works about the African Methodist Episcopal Church. All of these books discuss Allen’s life to a certain degree even though Allen’s name is not part of the book’s catalog record. Remember, a catalog search is not a full text search. Use the Google Preview links in the catalog to determine the amount of content dedicated to Allen or to link to available online editions of books. Use America: History & Life (AHL) to locate journal articles about Allen. AHL indexes scholarly journals such as Pennsylvania History and Methodist History.